Thanks to the hard work of the State Archives and State Library and many of our historic sites and museums, and to some innovative partnerships we’ve formed, you can browse thousands of items from our collections online and get great overviews of various subjects like the Civil War and aviation history through online exhibits. Nearly 90,000 historic and recent photographs, state government publications, manuscripts and other primary materials from the collections of the State Archives, State Library and several of other institutions available online in one place. 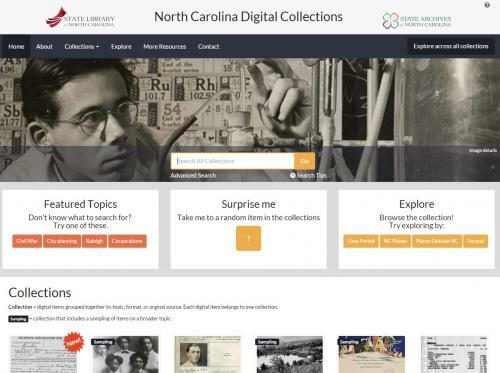 Our digital collections give you access to tens of thousands artifacts, publications, photographs, works of art and other materials related to North Carolina, and offer a small glimpse into the hundreds of thousands of these materials that make up our collections in total. Yearbooks newspapers, images and memorabilia from cultural heritage institutions from across North Carolina aggregated in one place. A comprehensive, online collection of historic maps of the Tar Heel State, featuring maps from three of the state's largest map collections. More than 500 images of the North Carolina’s Outer Banks and the broader northeastern region. A free and open archive that provides access to hundreds of thousands of social media records from selected North Carolina state agencies. More than 10,000 photographs and other audio-visual materials that showcase an array of subjects from North Carolina's past. Archived websites created by North Carolina’s state agencies back to 1996 as preserved by the State Archives and State Library. 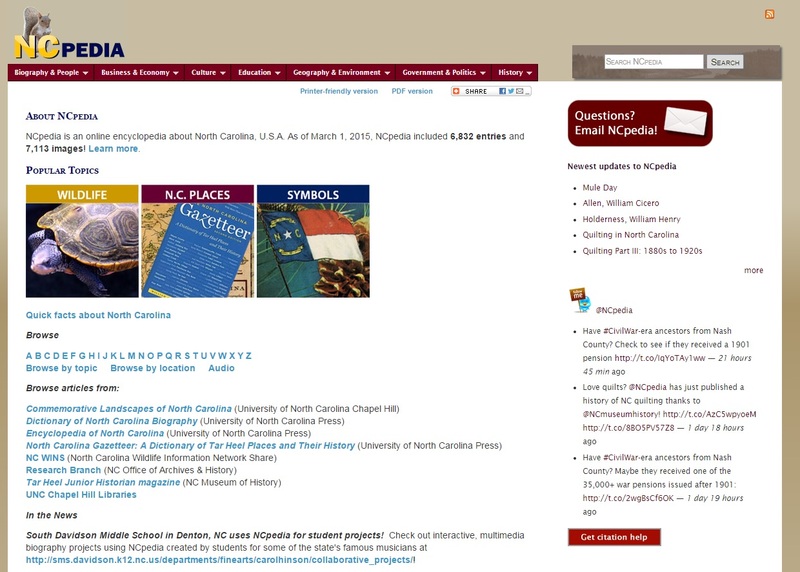 Part digital collection, part online exhibition, NCpedia is the online encyclopedia of all things North Carolina. More than 7,000 articles are accompanied by materials from across our collections, timelines, resources for educators and more. Ever wondered how the Blue Ridge Parkway has changed over time? Wondering how medicine has evolved throughout Tar Heel history? Learn more about these and other topics related to the Old North State by checking out our online exhibits. Take a virtual trip through the history of the Blue Ridge Parkway, North Carolina’s famous beautiful 469-mile "elongated park." From the herbal remedies that Native Americans used for centuries to the rise of the biotech industry in the past 20 years, explore how medicine has changed through North Carolina history.